A year ago Daniel Murphy had a partner in crime — a righthanded-hitting version of an infielder-turned-outfielder with a simlarly promising bat, questionable glove, hustling approach, and fresh off a hitting streak in AA. The two rookies gave the team a mild spark at the tail end of the season, with Murphy’s Wade Boggs imitation overshadowing the lesser but still promising performance of his B-Mets teammate. There was much excitement surrounding the two young men, as they exemplified the best of the fruits sown from the farm known as the Mets minor league system — a system that was gravely underestimated by the pundits (according to Farmer Minaya). It’s OK if you don’t remember the name of Murphy’s sidekick, as it’s a simple, common, unassuming name — one that sounds like it came out of a Hardy Boys mystery or a Hemingway novel. If you forget his name, don’t fret — it appears his own manager forgot it as well, since he hasn’t written it onto a lineup card for the last three weeks. CATCHING ON: Nick Evans has started only three games since an Aug. 25 promotion, but his idle time hasn’t been a complete waste. 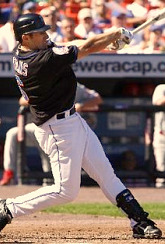 Evans has been working with coach Sandy Alomar Jr. on learning to catch as a way of increasing his versatility, although he wouldn’t appear behind the plate in anything but an emergency situation. Hard to blame Jerry Manuel for not using Evans when Nick’s been hiding in the bullpen all this time. – Why did the Mets wait until the last two weeks of the 2009 season to consider making Evans a catcher? Two years ago might have been better timing — when it was clear that his bat was his only tool but it wasn’t clear it would be enough to make him an everyday MLBer. – Why did Daniel Murphy get every chance in the world to succeed or fail at first base, while Evans toiled in AAA and then on the bench? If Evans and not Murphy had been the one in the middle of a once-in-a-lifetime hot streak last summer, would the roles be reversed today? Would Evans be starting at first base and Murphy hanging out in the bullpen trying to become more versatile? As mentioned in many other posts, I like Daniel Murphy. And I like Nick Evans. But I don’t get the logic behind giving one a fair shake while forgetting the other, especially once the Mets were out of the race. It’s not an issue of one or the other — Nick Evans could have been placed in left field to sink or swim at any time going back to early July. Instead we watched Cory Sullivan, Fernando Tatis, Angel Pagan, Jeremy Reed, and Gary Sheffield toil in the outfield — all players that I like, but all who “are what they are”, and not one of them with a chance to be a starting leftfielder for the Mets in 2010. With Evans there is still mystery, and hope, that he might be better than a bench player. His raw skillset, attitude, and aptitude are on par with Murphy’s, so why didn’t he get a similar audition at the end of a lost season? It’s too late to cry over spilt milk, but I’m happy to see he’s donning the tools of ignorance. I’d be even happier to see both he and Daniel Murphy behind the plate — they’re both tough enough, and over the long run it’ll help both their careers and the Mets to learn the position. It won’t happen with Murphy, but maybe Evans can make the conversion. Hopefully he’ll find a team this winter that will remember his name long enough to write it onto the lineup card. At least Thole is getting a look. I’d think it was that Jerry and the FO don’t like Evans for legit reasons (bad attitude, work ethic, or no signs of improvement) but with this team I just think he is being mishandled. The team I used to love is unrecognizable to me now. At least I’m a Jets fan (again, this is so weird to say) and I can see what the organization is trying to do and I believe in the staff there. Good point on Thole. Unfortunately it appears that Thole needs more polishing before he’s ready for MLB, but at least we know that now, rather than guessing and wondering about it all winter. With Evans it certainly is a mystery. Is he “cocky” like Tobi Stoner? Is he a slacker? We may never know. As for progress, he bounced back well after a terrible slump — showing he can handle adversity — and proved he could hit at the AAA level. But he wasn’t given any opportunity against MLB pitching, other than pinch-hitting sporadically. Hard to know what he’s capable of doing in 2010. Taylor, thanks for the link! That’s a fascinating article. It’s interesting that you more often find teams moving good-hitting catchers to other positions, rather than the other way around. I know, I know — catchers get banged up more often, blah blah blah. With an elite hitter like Joe Mauer, who is constantly missing time due to injuries, I can understand. But when it’s someone like Mike Jacobs, Robert Fick, or Justin Huber? Makes no sense. There would probably be more good offensive catchers in MLB today if teams weren’t so quick to move bats away from the position.